By spring, many Tahoe locals are dreaming of the fields of flowers and warm temperatures down the hill. Cabin fever sets in and some plan weekend escapes to warmer weather and rows of grapevines. One Truckee local not only dreamed of a place in the Napa Valley, but actually uprooted to the region while Truckee’s High Camp Home created a perfect retreat back up the mountain, combining true Tahoe grit with Napa’s rustic wine country charm. The client, who prefers to remain anonymous, hired High Camp Home to spruce up her early ’90s home, which sits tucked back in one of Truckee’s quiet neighborhoods on a large parcel of land. Fifteen years ago, when she first contacted the firm, High Camp Home started with the basics: new bathroom floors and fresh paint, just enough to give the home a lift. Though the owner dreamt of a major remodel, the years passed by until recently, when the dream became a reality and the design process began. The goal was to create a signature rustic Tahoe-meets-wine-country look, while warming the color palette and creating a playful, casual elegance for the home. In addition, the owner wanted to ensure that the space and finishes were durable. She rescues retrievers and at any given time there can be up to six dogs claiming residency. Making sure that the remodel was dog friendly is an understatement, as in this house, dogs rule. The house had great bones but was tired and needed to be brought into the new century with a new kitchen, living room, dining room, entry and powder room. High Camp Home drew up design plans to include renderings, furniture design and space planning. Then High Camp Home’s design-build team, High Sierra Customs, sprang into action and the client moved with her three dogs to Napa. The wood used in the project is from dead standing pine trees that Bill Lorrain, High Camp Home’s build partner, milled himself to get the exact saw marks wanted for the project. Milling the wood for the project, salvaging old barns in Northern California and making use of mainly reclaimed or natural materials on all of High Camp Home’s design-build projects, including this one, make the firm’s builds green by default. Through the design process, the flow of the home was opened up, while small intimate spaces were also created. Although site-lines were now a huge part of the open feel of the structure, the ability to close off areas was addressed in order to create cozier areas. 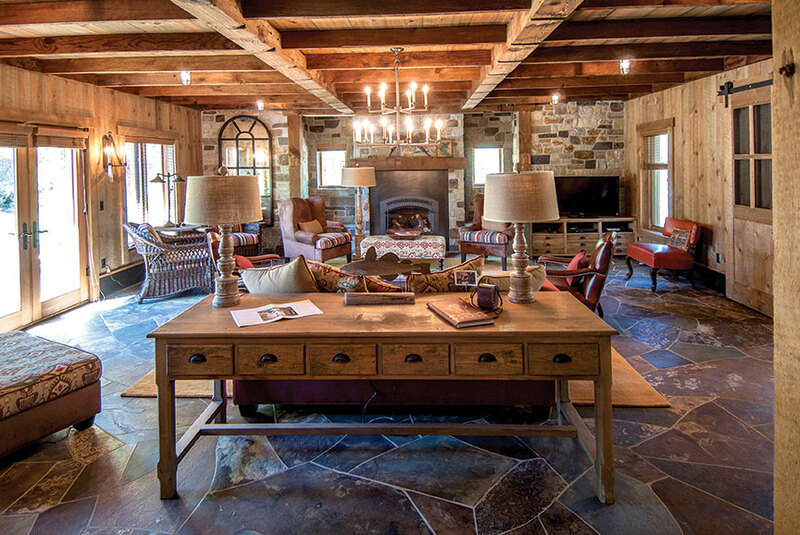 From arched doors and entryways throughout the house, this mission-style meets ’90s Tahoe home was transformed to resemble an old, Napa-area barn with planked walls, ceilings, sliding barn doors, re-sawn wide plank floors, stone and distressed painted cabinetry. The finish elements created warmth while the furniture—with its hints of reds, blues and greens—lent a fresh, farmhouse feel. Custom-forged iron and crystal wall sconces, pendants and chandeliers added to the charm. The durable floors and furnishings were definitely designed with four-legged friends in mind. As spring arrived in the mountains, the client and her dogs returned to the newly remodeled home. Although the homeowner still dreams of a Napa retreat, the change created in her Tahoe home allows for a little taste of wine country every day. Diana Vincent is owner and principal designer of the Truckee-based High Camp Home, which recently opened an office in the Napa-Sonoma region, www.highcamphome.com.